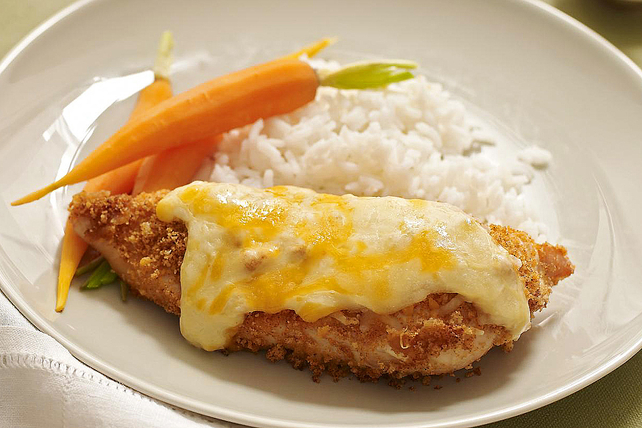 This baked chicken entrée is crisp and creamy - the chicken breasts are covered in a crispy coating and then baked with a cheesy sauce. Serve this Crisp-and-Creamy Baked Chicken with rice for a family-pleasing entrée. Coat chicken with coating mix as directed on package; place in 13x9-inch baking dish sprayed with cooking spray. Discard any remaining coating mix. Bake 20 min. or until chicken is done (170°F). Meanwhile, cook rice as directed on package. Mix soup and milk until blended; pour over chicken. Top with cheese; bake 5 min. or until melted. Serve with rice. Serve with hot steamed carrots. Store leftover condensed soup in covered container in refrigerator up to 2 days. To prepare as soup, mix with 2/3 cup water or milk and heat as directed on package. Place remaining coating mix in small resealable plastic bag; store in original box along with the unused shaker bag. Use as directed on package using only half the amount of chicken.